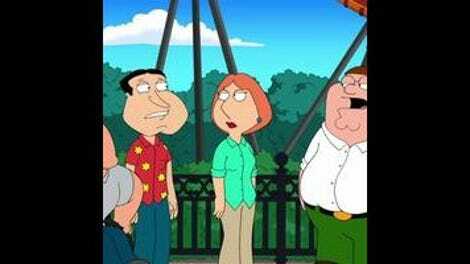 Family Guy is most successful when it can land a couple of solid jokes in an episode. That sounds like (and to some extent is) a truism, but there’s a reason for that that’s specific to the show. Because each episode is essentially the writers throwing everything they can think of at the wall, there will always be at least a few lazy, offensive jokes, and a bunch more that are just unfunny. But toss in some gems, and the laughter will buoy the rest of the episode. “The Most Interesting Man In The World” is a great example of that—there are more than enough bad jokes to make this an episode of Family Guy (including a lengthy child molestation riff), but there are also quite a few of the funniest bits the show has done all season. The episode starts out slow, with Peter taking Stewie to the park for some quality father-son bonding time, only to abandon him for the Clam (and a car full of clowns). So far, so boring. 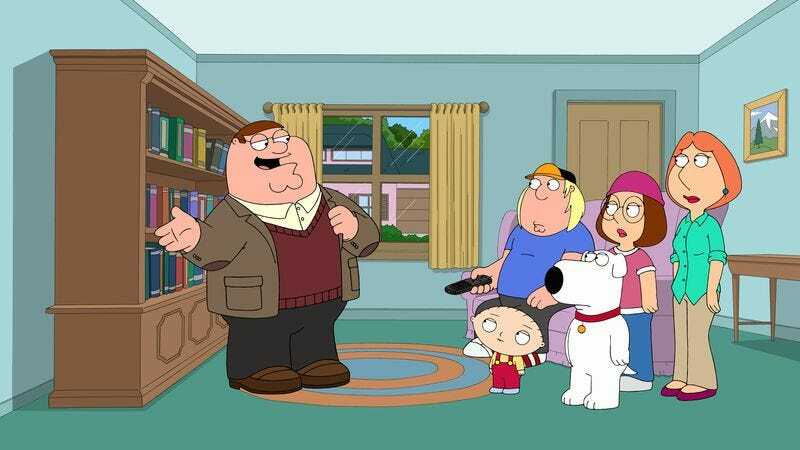 But Peter takes the wrong baby back from the park, and Lois throws a completely justifiable fit—Peter may claim repeatedly that he’s not an idiot, but yeah, we’ve been watching the show long enough to know that he is (the other baby, however, does not—Peter tells him he works at NASA). In an effort to make himself more interesting and less of a dolt, Peter goes to Chicago on a business trip and heads out to experience the world. Peter’s visit to the Art Institute in Chicago was, hands-down, the funniest bit the show has done this season. Partly, that’s because I live in Chicago and have spent some time there, so I’m inclined to give it additional credit here. Mostly, though, it’s because of the welcome vocal presence of the sadly deceased Dennis Farina, who narrates Peter’s tour through the museum with aplomb. Farina will be forever linked to Chicago, and he’s a perfect choice for this extended sequence, spending most of the tour talking about the food he’s eating and wondering how marble statues of women can have carved vaginas. Mostly, Farina is able to sell and elevate the crassness of the normal Family Guy dialogue. If only he were still around, and if only Family Guy got voice actors as gifted as him more frequently. After his Farina-fueled epiphany, Peter becomes intelligent and cultured, visiting all of the world’s major cities and, in a great little cutaway, renting a car with the radio stuck on NPR. (“How was the car?” “Coastal and superior.”) Smart Peter is a good variation on the character, one I’m sure has been done before, but that does allow for some actual contrast in a really poorly-drawn character—whatever Peter may be any given week, he’s never not an idiot. His newfound intelligence gives the writers the opportunity to make another solid “Brian is a blowhard” gag, in which he can’t name a single book he’s read (this is one of my favorite recurring jokes, dating back to his novel). It doesn’t hurt that Peter’s futile attempts at getting his family to not laugh at words like “Balzac” is reminiscent of one of my favorite episodes of How I Met Your Mother’s “Robots Versus Wrestlers.” The tension between smart things and the ways in which they sound dirty is rarely not funny. “The Most Interesting Man In The World” also, coincidentally, takes a dig at How I Met Your Mother and other CBS sitcoms, as two weird “foreign” guys write “relatable” comedies that run for 100 episodes. It’s possible that Family Guy is not the show most capable of pulling off an extended riff on CBS’ sitcom slate mocking their multi-cam “relatable” comedies. Most of the second half of the episode is very funny, but that doesn’t negate the fact that most of the first half of this Family Guy is spent calling attention to the laziness of its own jokes—Peter noting that he thought the clown car could only hold one person, etc. This sort of writing is good for a cheap laugh or two every once in a while, but it’s nowhere near enough to sustain an entire episode of television, let alone a series. Our reset button this week takes the form of Lois and Brian sending Peter to the dumbest city in the world to become lazy and irritating again: Tucson, Arizona. If only more episodes of the show were a bit more like its version of Chicago and less like its version of Tucson. Peter: “Man, I’m like the fifth-most attractive woman in Chicago.” Awww. “I live the life of the mind now.” I guess Peter took a trip to my campus before he left Chicago.